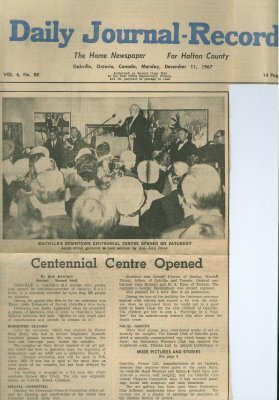 A clipping from the Daily Journal-Record of a column written about the opening ceremony of the Centennial centre. OAKVILLE – Oakville’s 1.3 Million civic centre was opened by lieutenant-governor of Ontario, Earl Rowe, at a ceremony attended by more than 500 people on Saturday. Among the guests who flew in for the ceremony was mayor Sarto Desnoyers of Dorval, Oakville’s twin town. After the ceremony, which was chaired by Reeve Herb Merry who had to borrow Magistrate Kenneth Langdon’s glasses because his own were broken, the civic and vice-regal party toured the complex. The complex on Navy Street consists of an art gallery which has been in operation since the beginning of September; and an adult and a children’s library. A semi-Olympic swimming pool will be open in February, 1968. It was due to open at the same time as other parts of the complex but has been delayed by three strikes. The building is situated on a 3.5 acre site which overlooks Sixteen Mile Creek. The site was originally known as Central School Common. Heading the Centennial Projects Committee which piloted the planning and construction of the centre was Councilor Ryland Kelly New. Architect was George Farrow of Dunlop, Wardell Matsui, Aitken, of Oakville and Toronto. General contractors were Richard and B.A. Ryan of Toronto. The company’s George Buckingham was project engineer. Also planned for a later date is an auditorium. During his tour of the building the lieutenant-governor chatted with visitors and scored a hit with the children when he promised them he would put in a good word to Santa Claus for the nice children of Oakville. The children got him to sing a “Partridge In A Pear tree” but his aide-de-camp rescued him after about the fourth verse. Many local groups have contributed works of art to beautify the complex. The Danish Club of Oakville presented a specially commissioned rug which hangs in the foyer; the University Women’s Club has donated the sculptured work, Tibetan Girl by Almuth Lutkenhaus of Oakville; Procor Ltd., manufacturers of oil tankers, donated four massive steel gates in the main foyer; the Oakville Hand Weavers and Spinne Guild have contributed a woven wall hanging; and the Oakville Centennial Projects Committee says it has received paintings, books and sculpture and cash donations. The art gallery has been open since September. Nine different exhibitions have been presented. The current one is a display of paintings by members of the Ontario Society of Artists.